Whether you're prepping for a shipwreck, economic collapse, a zombie attack, or catastrophic climate change, Ana Maria Spagna has you covered with her quirky collection of essential skills for a brave new world - from blacksmithing and falconry to bartering and music making. This makes for a super cute gift book for those who are survivalists, preppers, fans of post-apocalyptic fiction, and writers. 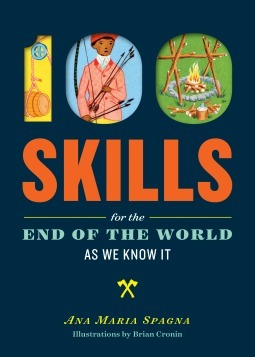 It's got an alphabetical listing of all the skills we'll need to have when life as we know it comes to an end. From blacksmithing to wheel-making to darning, all of the skills people used to have that have fallen by the wayside are included. My first thought after reading it was that it would make a great resource for any author writing post-apocalyptic fiction or dystopias. While it doesn't actually teach you how to do those things, it's a fun little book to flip through and consider all of the skills that we no longer have. Hazel Hayes is a graduate student living in New York City when she learns she is pregnant from an ill-advised affair with her married professor. More worrisome than the shock of this discovery is the apocalyptically bad timing; random but deadly attacks, all by women with light hair, have begun terrorizing the city's inhabitants. As the days pass, it becomes clear that the attacks are symptoms of a strange contagion that is transforming blondes from all walks of life--whether CEOs, flight attendants, students, accountants, television personalities, or academics--into rabid killers. Hazel--confused, desperate, almost penniless and soon visibly pregnant--flees the city and sets out to cross the border into Canada where she will find the one woman who just might be able to help her in a world gone awry. 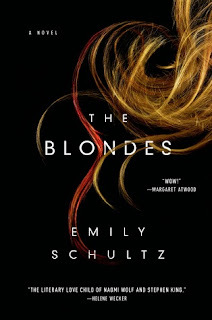 I love epidemic books, I love post-apocalyptic books, and I'm blonde, so this met a lot of my bookish standards. It wasn't quite as frightening or intense as I had hoped, but it does a great job of getting into the characters' minds. There's some action, but the majority of the novel is character-based and explores relationships between Hazel, her child's father, and his wife. I particularly enjoyed reading about Hazel's journey from New York to Canada and her experiences along the way. I think in general I might have preferred a bit more action. I like character development, but I didn't attach to these characters in a way that made me want to get to know them better. I'd recommend it to fans of character-driven work. Those who enjoyed Station Eleven might want to give it a try, but I'm not sure that the writing holds up under comparison. It's worth reading if you're a particular fan of any specific aspect of the plot, but those who don't have a sweet spot for epidemics and disasters might pass. Thanks to NetGalley for providing me with copies to review.